You will find here instructions about how to clean and prepare cauliflower before cooking. Even when you are using a organically grown cauliflower, wash it anyway to clear away dirt as the cauliflower head has a lot of tiny places to collect impurities before it reached your kitchen. It is quite possible that your cauliflower does not contain any dirt or insects but it may still contain some invisible chemicals / pesticides that were used to keep the insects away. In such a case too it is better to clean / wash the cauliflower carefully. I like to eat cauliflower dishes as well as raw cauliflower but I eat it only after cleaning it with the process given below. Take proper care before choosing a cauliflower. 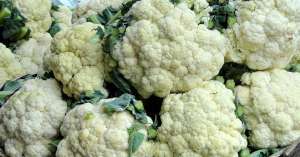 Choose a white and clean looking cauliflower which does not have any blemishes. Too yellow or brownish spots says that the cauliflower is not fresh. Cold water - to wash finally before using in cooking. Cut the long stem with a sharp knife. Cut the stem close to the cauliflower. You may break the florets with hand or cut them with a knife. If you find that the florets are too large for what you want to make, break or cut them in smaller pieces convenient for the dish you are planning to make. Heat water in a pan. Water should be hot but not boiling. Add some salt and add all the cauliflower pieces in the hot water. Switch the stove off. Cover the pan and leave it for about 5 to 8 minutes. You may see the dirt and tiny insects floating in water if there are any. 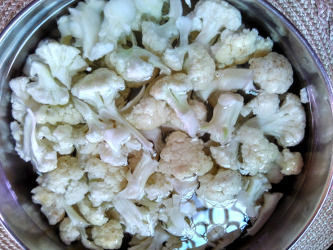 Remove cauliflower from hot water using a slotted spoon or you may pour the warm water and cauliflower on a large colander to separate water, and drain well. Hold the colander under running water or pour the cold water over the cauliflower to remove any dirt sticking. Put the florets on a thick towel to dry them. You will find the difference in color of the cauliflower, it will look cleaner and whiter. Now the cauliflower is ready to cook. You may make cauliflower pulao, gobi subji/curry, cauliflower fritters etc. 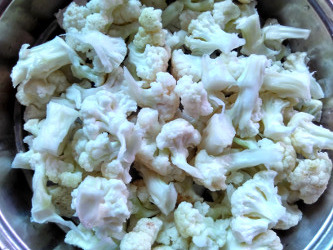 Wash the cauliflower pieces well in cold water even when there are no impurities.